We have a pricing model, which we stick to. The average price of all print books in the USA/UK is $19/£11. We are slightly above that. We are more of a specialist than a mass-market publisher. We give better discounts to authors than most publishers (50–70% rather than 10–30%), send out more review copies than most, invest more in marketing systems than most, and publish more new titles (highly expensive compared to reprinting already-strong authors) than most. Our prices for different page extents on print are given below. Competitive pricing: Our prices on new titles are in line with similar new titles bought out by the main publishers. What we cannot do, not at the moment anyway, is match prices of competing printed books that have already sold tens or hundreds of thousands of copies by established authors and been in print for many years. 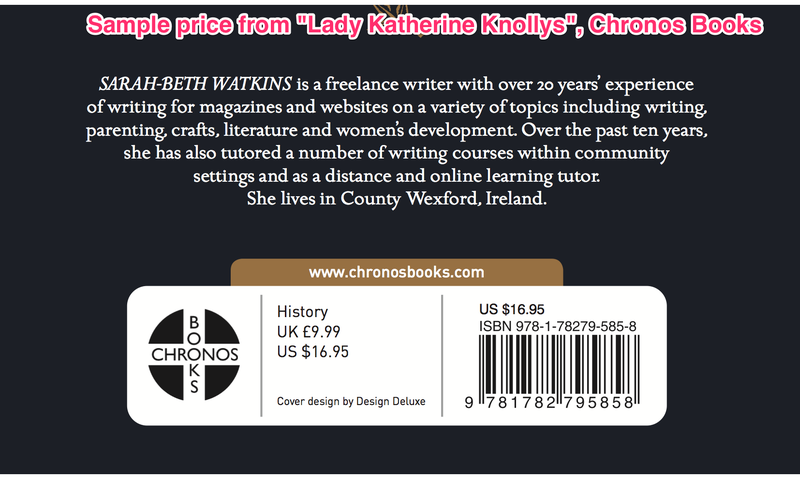 We are not likely to be able to match the average prices of titles you see in your local B&N or Waterstones. These are generally by established authors who have already sold in large quantities, which is why they are being stocked in the first place. Their print runs are far higher; 95% of new titles are not stocked there. As far as backlist goes, "classics," long-term bestselling books, all tend to have a low return rate. The sales pattern is relatively easy to monitor. They are more frequently ordered. First-time books are more speculative. With an average returns rate in the trade of 70–90%, first-time book prices are proportionately higher. Effectively the price has to cover the cost of selling it and sending it two or three times rather than once, as well as the higher origination costs in proportion to sales. In relation to the table below we're under the average price on shorter books and above on longer books (also, our ebook price is generally well below the big trade publishers). Pricing on older books, and self-published books: Prices in more specialist areas have also increased by 30–40% over the last half-dozen years, so comparing it with an older book on your shelves may not be accurate. We also can’t match the prices of self-published books that sell only through Amazon, if at all, and don’t have to work around shop discounts and sales/distribution costs. If you are a first-time author, you are likely to be selling at a disadvantage price-wise. There is no way around that. Different pricing from the retailer: The price we set for the books though is one thing, the price a customer might set for it is another. We do not have any control over the prices charged for our titles. Nor does any other publisher (there used to be something called the Net Book Agreement in the UK, which fixed the price at which books could be sold, but that is long gone). It is up to the retailer what price they sell them at. If they run promotions and discounts to reduce the price further, later, it is up to them; it does not mean that we are selling them the books more cheaply. So it is quite possible that if they are clearing stock (which could be for all kinds of reasons, not necessarily anything to do with the sales of your title), they will be selling books at a lower price than you can buy them from us. You may also see your book offered at a price above RRP. In 2016 Amazon UK started to implement a policy of not displaying RRP, and have been offering some books at prices £1 or so above RRP. This is their prerogative, we have queried this practice but Amazon are within their rights. This does not directly effect revenues or royalties on a sale. Amazon UK still pays JHP 45% RRP. Rounding-up: We follow standard practice. We would like to round all our prices to the nearest $/£, i.e. $18 or £9 rather than $17.95 or £8.99. It seems insulting to people’s intelligence that £0.01 or $0.05 should make a difference. But in the UK the sales reps say that the shops say that £0.01 does make a difference. In the USA the sales reps say that the shops say that $0.01 would be insulting, but $0.05 makes a difference. It’s not a priority issue. Our pricing model: We’ve created a pricing structure at four different levels, below, which gives us a break-even point (covering direct costs, some overhead, but not marketing, free copies for review etc.) at around 1000-1500 copies sold at the lower price, and around half that at the higher price. Band (a) is solely for fiction. Band (b) is for MBS titles. Band (c) is for general non-fiction, including Zer0 Books titles. Price (d) is for Academic titles that are not really price-sensitive at all, and are unlikely to sell in high quantities, but worth publishing for a discerning readership, who are prepared to pay for them. The vast majority of our titles, 90% plus, are at (a), (b) or (c). Exceptions: Children's fiction is more price-sensitive, and we calculate it differently (different font sizes). Up to 30,000 words = £5.99/$9.95; 30,000 to 65,000 words = £6.99/$11.95; 65,000 to 100,000 words = £7.99/$12.95; over 100,000 words = £9.99/$15.95. Reducing the price: If it is a question of getting a really competitive trade-market price for a book that could sell in quantity through general stores, then we will look at that. But the Proposal needs to be convincing. It is a rare occurrence for a first-time author. It is always possible to reduce the price later if the book looks like it has "legs" for that market. Pricing on a cost-plus basis: We are often asked if we can sell books to authors or through the trade on a (print) "cost-plus" basis. The answer is "no." The direct costs in a book, design/print etc. are a small fraction of the overall cost. Most of the cost is in the systems, getting it to market, making it available, discounts to the trade, etc. Which does not guarantee results, sales-wise, but it has to be done. Changing the price: As a general rule prices cannot be changed after the information goes out to distributors, a month after the files are finished. We do review prices across the board, every year, and particularly if the book has been in print for some years it may be necessary to change the price to reflect current pricing. If a price is changed, we are required to give accounts (Borders, Barnes & Noble, Baker & Taylor, Ingram etc.) three weeks to update. The stock with the old price has to be cleared before stock with the new price can go in, because books are stored by ISBN. The two editions will be mixed if there is still stock of the old price, which means older books will be invoiced at a price which does not match the price on the book. So it means the book will be out of stock for around a month. Stickering with a new price: If we have to change a price on existing stock, it is possible to do it by stickering the books in the warehouse, but it is disproportionately expensive. It will also lead to some confusion in the trade, because books with the old price on them will still be at various distributors around the country (to a lesser degree this also applies when we wait till the stock in the warehouse is cleared). Does price matter? The answer is it must do, and on ebook sales, in fiction, it certainly does—just look at the pricing levels of the top 100 on Amazon Kindle. But whether a printed book is priced at $16.95 or $19.95, $22.95 or $24.95 seems to make no difference to sales, so far as we can tell. We do track prices of similar new books coming out, particularly through our own distributors, who are very aware of different lists that they’re selling, and stay in line with them. Other currencies: We have US dollar and pound sterling prices on the back cover, and on the website. We cannot give you an exact answer on the price in other currencies. They’re generally fixed at short notice by different distributors based on current exchange rates, and you will need to contact them. We aim for rough parity in our pricing across different currencies, but it varies a lot by country. Canada: In general we keep Canadian prices the same as the USA, as the exchange rate between the Canadian and US dollar is nearly equal. Australia: In Australia, book prices are higher than in the USA/UK. This is partly because salaries are higher, partly because of Australian VAT (GST), partly because of parallel import restrictions imposed by the government to protect Australian publishers, partly because of the distances involved. We do not get any benefit from the higher prices—we supply to the distributor, Brumby, at the usual discount off the UK retail price. In 2011 Brumby are marking up the UK retail price in by £2.4 to get to the AUS $ price. (Note; since taken over by Sunstate, 2012, slight changes here—it's now the US $ RRP x approx 1.5 times. This normally covers GST, freight and handling.) The cheapest way to buy our books in Australia is online, through The Book Depository, which is usually 25–40% less than buying through bricks-and-mortar retail. We recommend them. On books we ship to Australia, we lose money. South Africa: In South Africa, as a rule of thumb, the SA retail price of books is UK RRP x exchange rate (in Autumn 2011 £1=R12), plus shipping/handling etc. (about 12%), plus VAT (14%). Bookshops sometimes add a very small mark-up of about R5. Page extent/price (our average word count per printed page is 320). For Mind, Body, Spirit the ebook price is 50% of print price. Made Easy, Pagan Portals, Shaman Pathways and Compass Points series are $5.99/£3.99. Zero, Iff, Chronos, Business Books and general non-fiction: Ebooks will be priced at 80% of print price. The exception is the Advancing Conversations series, which is $3.99/£2.99. All YA Children's Fiction is $6.99/£3.99. Consistency: These prices can vary when they appear on retailers’ websites. When customers search for ebooks in foreign markets, local taxes or surcharges will often be added to the price e.g. Value Added Tax in UK. Rounding up: Prices have to end in 99 cents or 99 pence—this is an industry standard. iBookstores for instance will not stock an ebook unless it has a price ending in 99 cents. Changing ebook prices: this is easier to do than changing print prices, but still time-consuming. The ebook price we set at publication cannot be changed and will be kept until we review it at 500 copies when the next publicity effort kicks in; if after 18 months your title hasn't sold 500 copies then you can request an ebook price-drop which we will consider at our discretion. We do occasionally run special offers where we will offer certain ebooks at lower prices for a month or two to increase visibility. You can request an offer on the Author Forum. Please give us at least two months' notice. The merits and otherwise of low ebook pricing: While bringing your ebook out at a lower price does not in itself guarantee any sales, it can mean that people are more likely to buy it on impulse, particularly if there are good reviews. And if they like it, they may recommend it. You still make about twice the royalty on a $5 ebook at 50% (after retail discount income probably $4, so $2) than on a $20 print book at 10% (nearer $1, after shop discounts). The counter argument is that readers can see price as a measure of quality, so don’t be tempted to sell yourself cheap. The debate on book pricing rages long and loud amongst bloggers, authors and publishers. Search the internet on “ebook pricing” for the latest views and experiences.